Argumentative essays are written to persuade the reader that the writer’s point of view is correct. To effectively argue his/her position, the writer has to corroborate their ideas with solid evidence and facts. Argumentative essay takes into account the possible counter-arguments and objections and effectively refutes them. Any argumentative essay, therefore must represent a balance between the pros and cons, the writers arguments and the opposition arguments. An effective argumentative essay features not only effective argumentation of ideas but also effective refutation of possible counter-arguments. The greatest weakness of argumentative essays is the writer’s tendency to negate counter-arguments and other opinions on the topic. Writers should objectively analyze the topic and their own ideas. They should respect the opinions of other researchers and writers, and use their skills, linguist﻿ic ability, evidence and facts to argue effectively. Introduction of the chosen topic. General discussion of the topic. Thesis statement. Body paragraphs 1-3. Arguments, evidence and facts that uphold the writer’s opinion. Discussion of these arguments, evidence and facts. Body paragraph 4. Transitional paragraph. Introduction of counter-arguments and opposing points of view. Body paragraphs 5-6. Rebuttal #1 of counter-arguments. One should always use external sources rather than solely personal opinion. Every opinion in the rebuttal should be referenced and supported by a quote. The quotes are also explained in these paragraphs. Body paragraph 6. Rebuttal #2 of counter-arguments. Body paragraph 7. Rebuttal #X of counter-arguments. Summary paragraph. The primary points and thesis statement are reviewed and summarized. It is also recommended to place various recommendations, proposals in this paragraph of an argumentative essay. To write a good, professionally-looking argumentative paper, it is necessary to possess knowledge on the subject and to research and analyze not only the pros but also the cons on the topic. 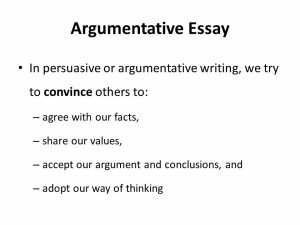 The homework for writing argumentative essays is to prepare for the written debate where the writer should predict, know and refute counter-arguments. Then, they should argue a different position and provide enough evidence to uphold it and persuade the reader. Before writing an argumentative essay, the writer should evaluate his/her knowledge of various topics and choose only those topics which they know what to write about. Furthermore, the writer needs to keep in mind that not all topics can be effectively argued and successfully used in argumentative essays. The most popular topics for argumentative essays are those that clearly have different groups of supporters and opponents. There are supporter and opponents of abortion, supporter and opponents of euthanasia and supporters and opponents of drug legalization. Many students might be prompted to write about these topics, yet once they start, they already have a disadvantage. It is virtually impossible to impress a professor who has already read thousands of essays on abortion, euthanasia, drug legalization or gun control. One should also consider the background of the audience for whom the argumentative essay is written. If the chosen topic and writer’s opinion differ widely from the generally accepted human beliefs, the professor might as well give a suboptimal grade for it.